Krakatoa is an Indonesian volcano which is responsible for an eruption that took place in August 1883. It was one of the most deadly volcanic eruptions of modern history as approximately 36,000 people died. This eruption released 11 cubic miles of ash into the atmosphere. Many people died as a result of thermal injury. It is located in the Sunda Straight, right in between the Javan and Sumatra islands. It is a part of the Indonesian Island Arc. Each and every eruption so far on Krakatoa has caused massive and destructive tsunamis. Krakatoa is one of many volcanoes located in an area which is known by geologists as the Ring of Fire. The correct Indonesian name for this volcano is Krakatau. The spelling was written wrongly by the British press while reporting the eruption. 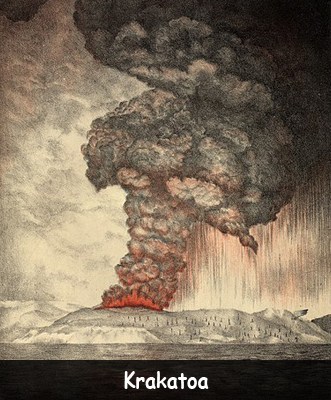 The eruption which took place in 1883 generated the loudest sound ever reported in history. The sun was blocked out for several days because of the volcanic fallout in the atmosphere. There are a total of 167 known active volcanoes in the region. The fury and fallout of this eruption caused global temperatures to plummet for at least a few years. Anak Krakatoa a new Island volcano began to form in the region back in 1927. The first recorded instances of volcanic activity on Krakatoa date back as far as 416 AD. Declan, Tobin. " Krakatoa Fun Facts for Kids ." Easy Science for Kids, Apr 2019. Web. 26 Apr 2019. < https://easyscienceforkids.com/krakatoa-facts/ >.